A combination of mounting liabilities and erosion of pricing power in the peak season for air travel is threatening more turbulence for India’s airlines. 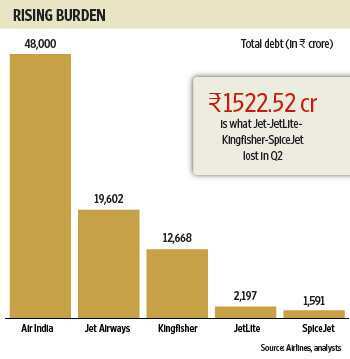 Collectively, the five leading domestic airlines—Jet Airways (India) Ltd and its unit JetLite (India) Ltd, Kingfisher Airlines Ltd, state-owned Air India Ltd and SpiceJet Ltd—are weighed down by ₹ 84,058 crore of liabilities. That includes bank loans as well as money owed to jet fuel vendors and airport operators, among others, according to the airlines’ financial statements and analysts. Data for the largest low-fare carrier IndiGo, run by InterGlobe Aviation Pvt. Ltd, and GoAir, operated by Go Airlines (India) Pvt. Ltd, aren’t available because they are privately held companies and don’t have to disclose such numbers. The debt burden is affecting the viability of an aviation industry that’s not able to increase fares even in the peak travel season because of excess seat capacity. Typically, airlines offset losses made during the lean season by charging higher fares in the peak season, taking advantage of a strong passenger demand, but Indian carriers don’t command that pricing power. The mid-September to early January period is considered the peak season for air travel in India; most festivals are celebrated during this period, including Diwali and Christmas. While airlines blame high jet fuel prices and sales tax imposed by various states for their losses and swelling debt, experts warn that the viability of Indian carriers is at stake and most airlines’ bank loans may turn bad. State-run Air India has a total debt of ₹ 48,000 crore, Jet Airways ₹ 19,602 crore, JetLite ₹ 2,197 crore, Kingfisher Airlines ₹ 12,668 crore, and SpiceJet ₹ 1,591 crore, according to airline executives and sector analysts. Total debt is the money an airline owes to external stakeholders including banks, caterers and oil companies that has to be serviced either in the short term or the long term. In times of distress, debt serves as an apt measure of an airline’s solvency, experts said. “Increasing liabilities will force some stakeholders to cut their exposure to the airlines, thus inhibiting growth, like oil companies refusing to fuel aircraft unless paid in cash," said a senior analyst with a domestic brokerage. “A cash-strapped airline then cuts flights, inconveniencing other stakeholders and growth gets inhibited." “Ultimately, the airline is forced to shut operations or sell out. We have seen this happen to Paramount Airways (Ltd), Deccan (Aviation Ltd) and Sahara (Airlines), in the past," added the analyst, who didn’t want to be identified. Kingfisher Airlines has been forced to curtail its services this month, cancelling up to 50 flights a day, because the routes are unprofitable, given the high fuel costs. In mid-October, state-run oil refiner Hindustan Petroleum Corp. Ltd temporarily suspended supply of fuel to Kingfisher Airlines for the second time in four months. 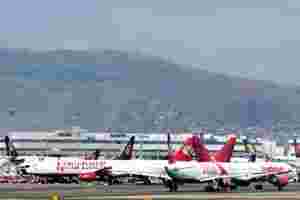 The Delhi and Hyderabad airports, too, have threatened to deny Air India and Kingfisher Airlines credit and have demanded upfront cash payments for using their facilities. A senior executive with an aircraft spare parts supplying company, requesting that neither he nor his company be named, said short-term payables are very high for private airlines and Air India. His company is contemplating legal action against some private airlines, he said. The airline industry threatens to create problems for domestic banks, mostly public sector lenders, and it is time the government takes steps to stop the situation from worsening, Jasdeep Walia, a senior analyst at Kotak Securities Ltd, wrote in a report dated 18 November. “One of the major policy responses could be a reduction of state sales tax on fuel from average levels of 24% (average across states) to 4%. This could be done by changing the status of jet fuel to ‘declared goods’, which would attract a uniform state sales tax of 4% across India," Walia wrote. “As per industry sources, to get the states to toe the line, the centre would need to compensate them for the losses (Rs 2,500 crore every year)." Walia added that the tab would be much lower than what the government would have to bear in case the situation persists for long. The risk is that banks will pile up non-performing assets (NPAs), requiring them to set aside money to cover these, in turn denting profitability. Kingfisher Airlines has sought ₹ 800 crore as additional working capital, citing the fact that jet fuel prices have risen consistently since its creditors last restructured its debt. Air India has submitted a debt recast plan to the Reserve Bank of India for approval. To add to their woes, airline capacity has matched growth in demand. Sanjay Aggarwal, chief executive officer of Kingfisher Airlines, said the Indian aviation industry grew 20% in the September quarter, but capacity also grew by an identical margin. “This is a classic case where airlines are not having pricing power. It will be difficult to survive in an industry where you are just price takers," said Neeraj Monga, executive vice-president and head of research at Toronto-based Veritas Investment Research Corp.
Kingfisher’s Aggarwal said neither the September quarter results of the Indian airline industry nor the seat-booking trend for the so-called peak season were confirming an uptick in demand. In the September quarter, SpiceJet, Kingfisher Airlines, Jet Airways and JetLite posted a combined loss of ₹ 1,522.52 crore. Jet Airways topped the list with a loss of ₹ 713.6 crore, followed by Kingfisher Airlines ( ₹ 468.66 crore), SpiceJet ( ₹ 240.06 crore) and JetLite ( ₹ 100.2 crore). According to the Federation of Indian Airlines (FIA), a lobby group, the aviation market continues to grow at an annual 15%, but all domestic carriers are incurring significant losses by selling tickets at 30% below the cost of operations. The group, in an October document submitted to the government, said that since last year, costs have gone up by around 30%, primarily due to a 40% increase in jet fuel prices, higher landing and navigation fees, and bank loan rates. But on average, fares during this period declined by about 10%.